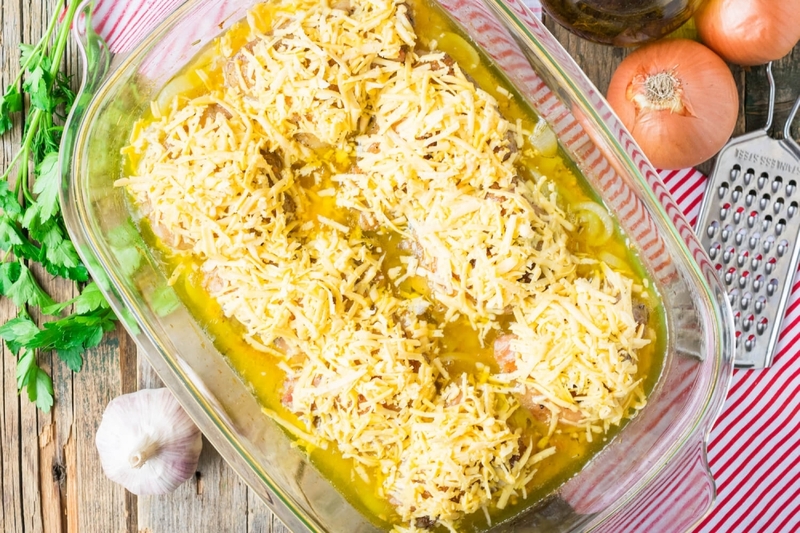 Let’s make a tasty warming dish for a family lunch. 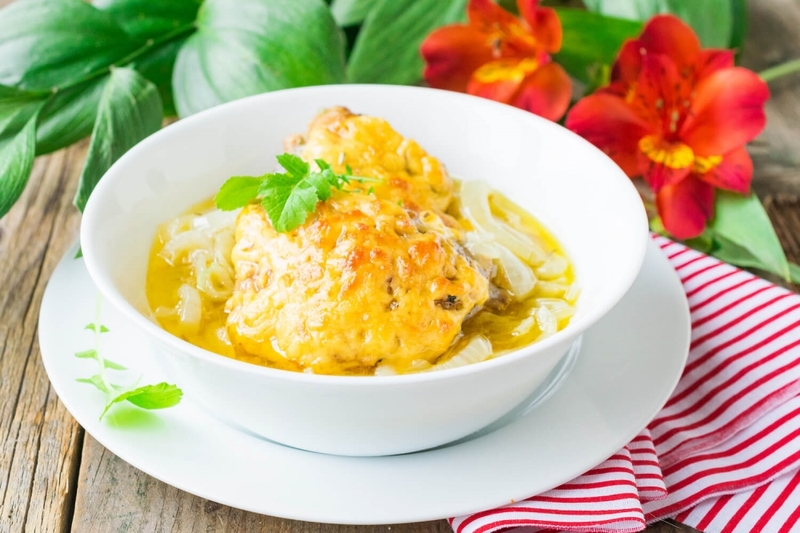 The chicken baked in onion sauce with hard cheese turns out incredibly juicy, gentle and fragrant. 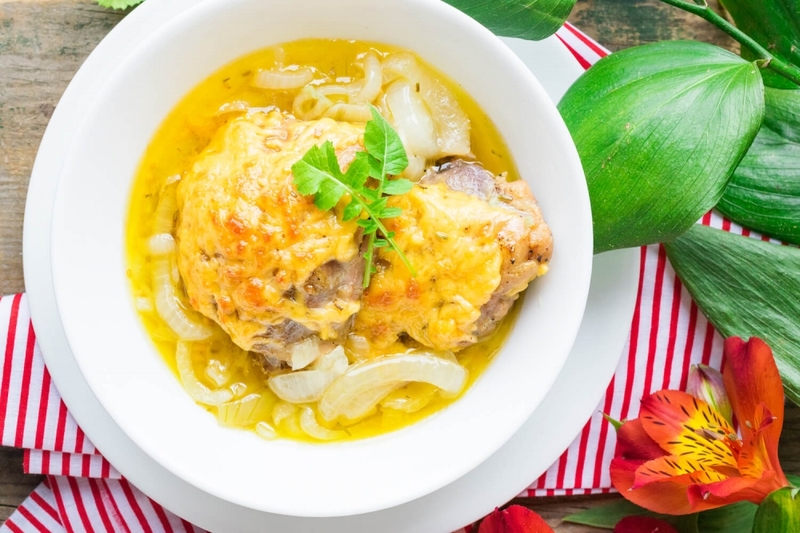 Appetizing pieces of meat with a large amount of gravy can be completed with gentle polenta, mashed potato or celery puree. Don’t forget to buy the crispy baguette for lunch. It’s very tasty to dip slices of fresh bread in fragrant dense sauce. 1. 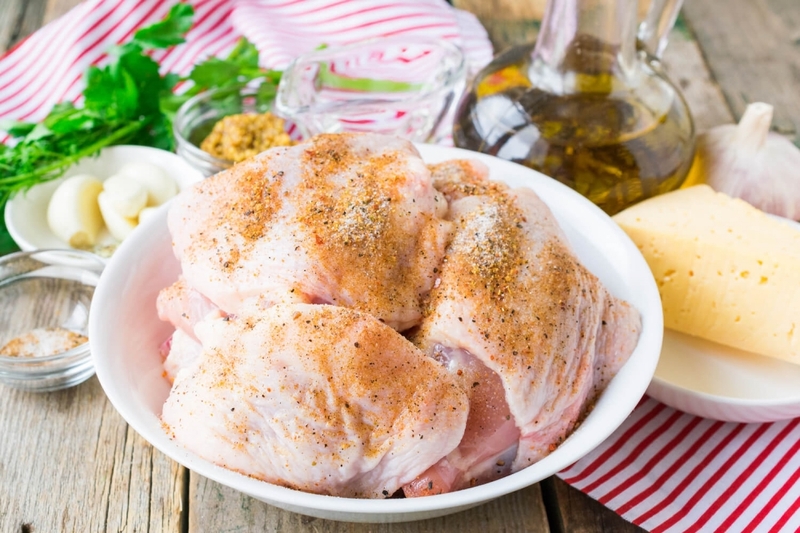 Wash and dry from excess moisture with paper tissues chicken thighs. Let's rub meat pieces with mix from salt, black ground pepper and chicken seasoning. 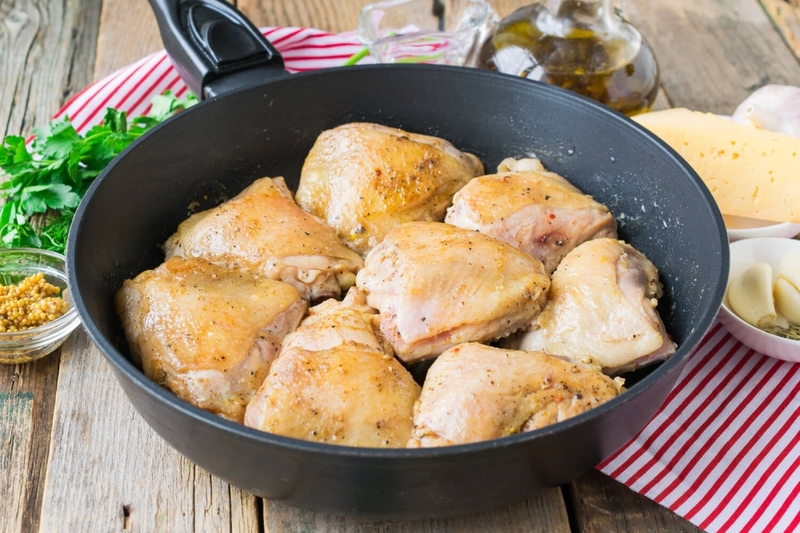 Leave meat at least for 30 minutes so that it becomes impregnated with aromas of seasonings. 2. Peel and cut into half rings onions. 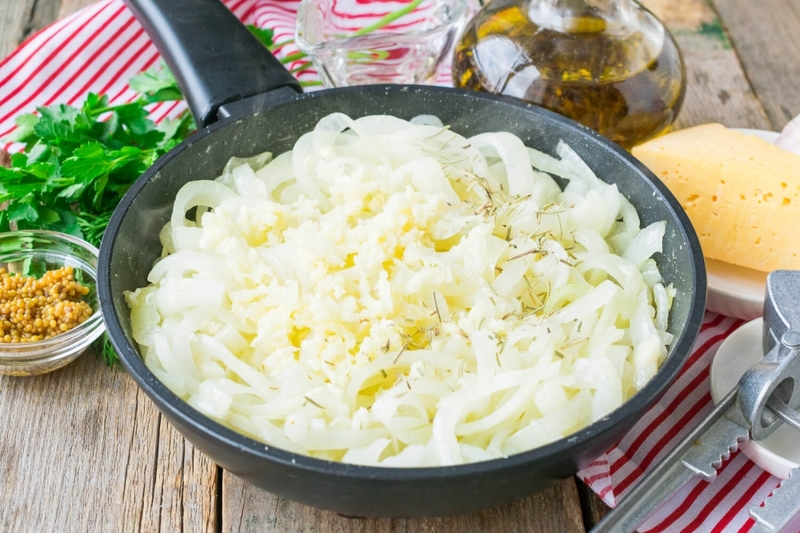 Lay out the cut onions in a deep frying pan with the pre-heated butter. Stirring slowly from time to time, brown onions till soft. 3. 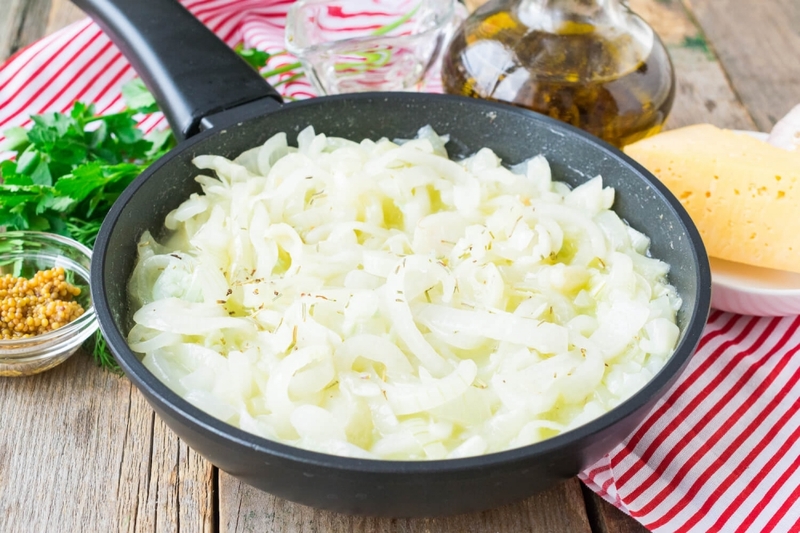 When onion is fried and become soft, add to it passed through a press garlic cloves and dry rosemary. Mix and continue to fry ingredients together 2-3 minutes more so that seasonings and garlic disclosed the aroma. 4. 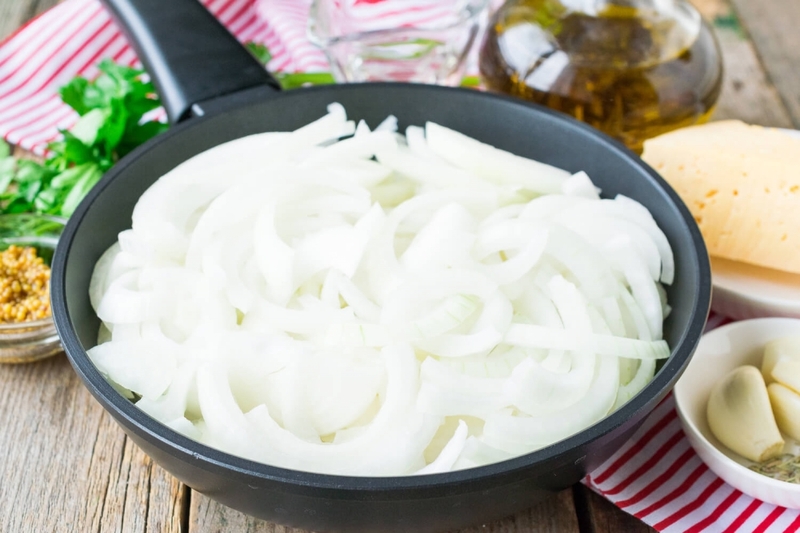 Then pour in a frying pan with the browned onions 200 ml of hot water or chicken broth. Let's simmer onion on low fire for 7-10 minutes till liquid boils down slightly. Next shift the browned onion together with broth in a heat resisting ware for roasting. 5. Meanwhile, let’s prepare meat. 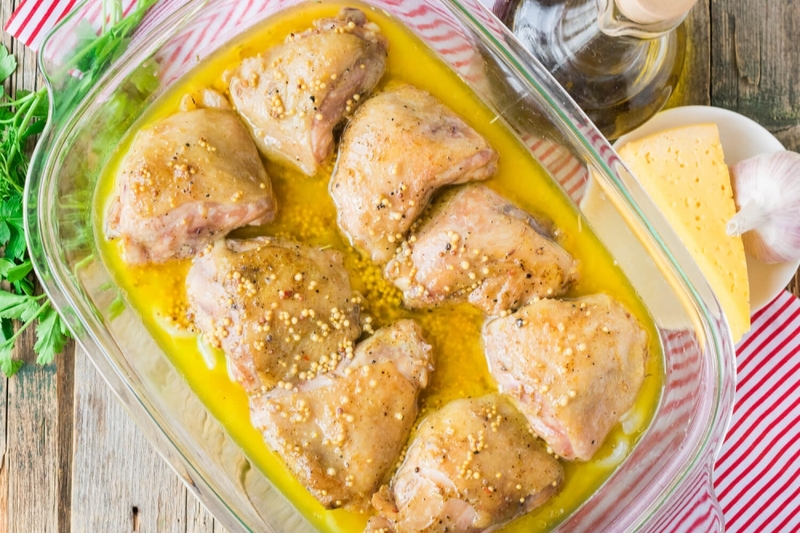 Lay out marinated chicken thighs on a frying pan with pre-heated olive oil. Fry meat on middle fire to a golden crust from both sides. 6. 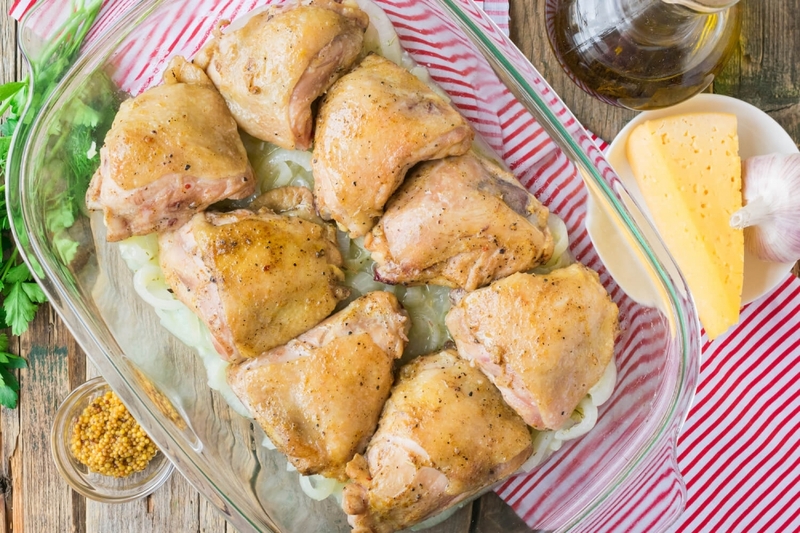 Lay out the fried chicken thighs on an onion bed. 7. Let's make sauce. In a frying pan in which we fried chicken pour in the remained chicken broth or water. Let's bring mix to boiling. Then add apple vinegar and Dijon mustard to sauce. Periodically stirring slowly, reduce sauce twice by boiling. 8. 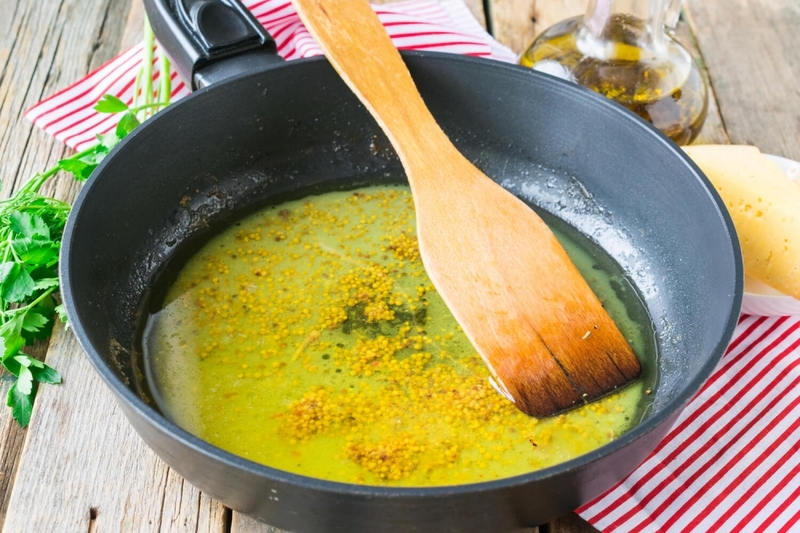 Let's pour out ready-made sauce in a heat resisting ware with other ingredients. 9. Without covering the ware, send it to the oven pre-heated up to 200 degrees. 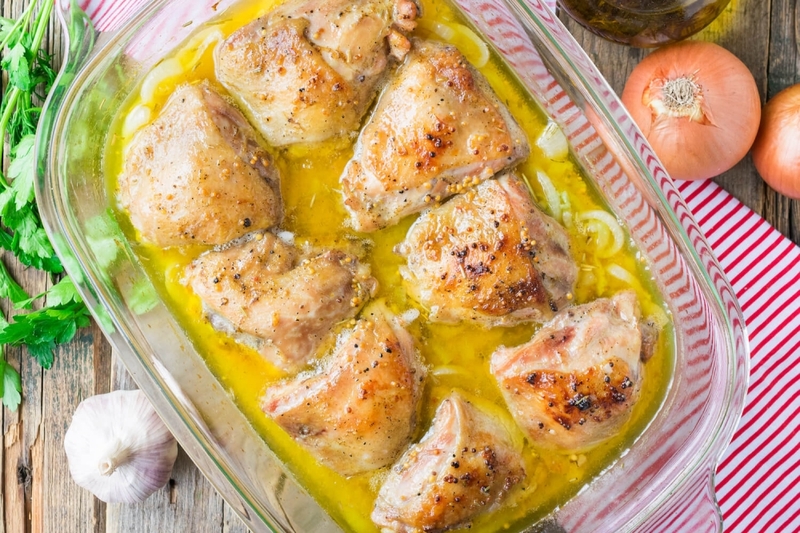 Bake chicken in onion sauce for 30 minutes to a ruddy crust. 10. Then get the ware from an oven. 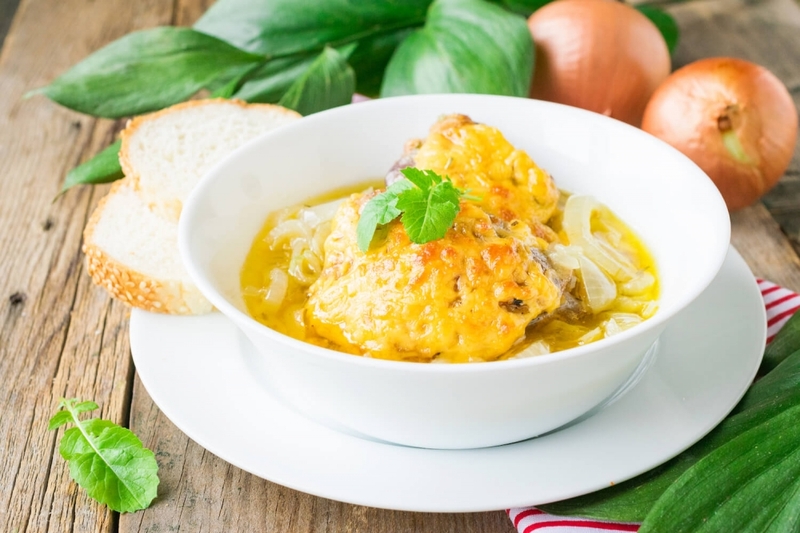 Strew the pieces of chicken with grated hard cheese. Let's return meat to an oven for 5-7 minutes so that cheese melt and brown. 11. Ready dish serve hot together with onion sauce, decorated with fresh greenery.